The finest range of vintage jukeboxes in top condition. All models are available to view and listen to in our showrooms and come with free delivery and installation. Finance available. Our range of Vintage Jukeboxes includes some of the most iconic jukeboxes ever built, lovingly restored and supplied at fantastic prices. The first jukebox to play multiple records was invented in 1927, and kick-started a craze for recorded music, rather than live bands, in clubs and bars. The designs became ever more striking with eye-catching coloured lights, fun bubble tubes, shiny chrome grills and ever varying designs. Soon, every bar and diner was trying to outclass each other with the best models and most popular designs to draw in a young crowd, hungry for the new Rock and Roll music of the era. While classic jukeboxes are not as popular as they once were, with the advent of CD, MP3 and streaming, they are still fantastic and irreplaceable for enthusiasts and collectors. Currently, with an increased popularity in vintage products and the vinyl record, jukeboxes are making a comeback. More and more people are seeking out these nostalgia inducing machines to add a sense of excitement for a bygone era to any room. 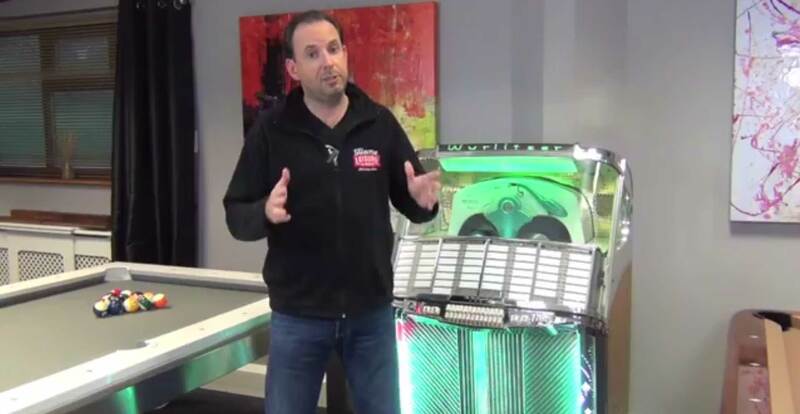 Here at Home Leisure Direct, we are passionate about jukeboxes and specialise in vintage models, only selecting the best in quality for their age. We carry jukeboxes from the late 40s and 50s which are especially hard to attain in such good condition. Many of our vintage jukeboxes have been lovingly restored by experts in the field to ensure our customers get their beautiful classic machine in the best condition possible. These thrilling machines play 7" records at 45 RPM, so if you have a vinyl collection tucked away somewhere safe, it's time to dust off those old records and get them loaded up into a beautifully made silver age jukebox. For maximum ease and enjoyment our vintage models run on freeplay, but coin mechanisms are usually simple to re-connect with some kind attention, although, due to the nature and age of these products, many of the coins that operate the system may be foreign or out of circulation. These breath-taking machines are real works of art and will be the focal point of any room. In the flesh they are an irresistible addition to a games or leisure room, so come and see the models we currently have available to view and demo in our Bristol showroom. Our staff are highly trained in all the technical aspects of the stock we hold and will be happy to help you choose the best model for you. But you’ll need to be quick as they are very popular and are notorious for being snapped up fast! We also run a waiting list for our customers for particular models in case we come across one during our travels. If there is a particular model which you are looking for, please let us know and we will log your details and requirements.